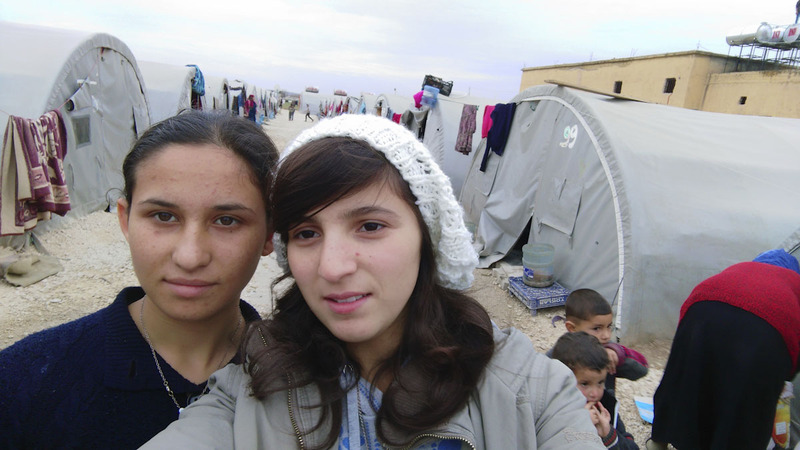 We first met Jiala in a refugee camp in Suruc, she told us she was going back to Kobane the next day. She escaped 6 months ago, when ISIS attacked the city. She saw some of her friends killed and she says if she had a gun she would have gone to fight with the Peshmerga. She didn’t want to leave, but when they got to the border, they were loaded into trucks and brought to a refugee camp in Suruc, Turkey. Her father stayed behind, to fight. The day she returns to Kobane, we follow her to the border. Kobane is right there, across the fence. They are in line, searched by the Turkish police, documents checked and filed, they cross over. We are not allowed, we wave goodbye. Jiala cries all the way. At night we manage to get to Kobane through the clandestine way, 3 hours drive in a van up and down the hills, on unpaved roads, then a run of 200 meters across a muddy field, barbed wire fence and a railway; there we can rest a few minutes, then walk up a hill, where another van is waiting for us. The driver know what he’s doing when he only flashes the lights at times, Kobane is surrounded by the ISIS. Finally we get to Kobane, but it’s dark there. The day after, a shameless sun shows us the battered city. We meet Jiala and her family, they are happy to see us, they embrace us. They take us for a walk into town, it’s like a procession in the cemetery of her life memories. All is smashed down, the Coalition forces have pounded hard to crash the ISIS. Many corpses of the ISIS are still trapped under the rubble. With a smartphone that we have given her as a present, she takes pictures of all she sees, she goes close to a dead ISIS member to take a close-up, she needs to see what kind of animal he is. Jiala shows us her two houses, completely destroyed, now she lives in her uncle house. She sorts through the rubbles, finding some familiar objects, but she cannot see her books, although she knew where she had left them. Nothing has remained the same.